Bird's-eye view of Anamosa from a lithographed post card by M. M. Mott, noted Anamosa photographer, 1906. My guess is that this was taken from on top of the prison, looking toward the southeast. From The History of Jones County, Iowa by Western Historical Company, Chicago, 1879. This is the county history portion of the book. The biographies from the book are posted HERE and the Civil War Roster HERE. The Diaries of George Franklin "Frank" Howard, Clay township resident (in our Families Section). Jones County was named in honor of George Wallace Jones, U.S. surveyor, delegate to Congress from Wisconsin Territory, and U.S. senator from Iowa. The county has had three county seats, the first of these being Edinburgh. A small log cabin was built and used as a courthouse. Although it was the county seat, the town showed no signs of growth. Angered at having a "city of grass" as a county seat, the citizens voted to remove the county seat to one of two places—Newport or Dale's Ford. Newport was selected as either a joke or due to political maneuvering, because no courthouse was ever built there nor was any court ever held there. The town of Lexington was selected as the third county seat in a spring 1847 election. Lexington was later renamed Anamosa, after the daughter of Winnebago Chief Nas-i-nus. County business was conducted in private homes until a courthouse was constructed in 1848. 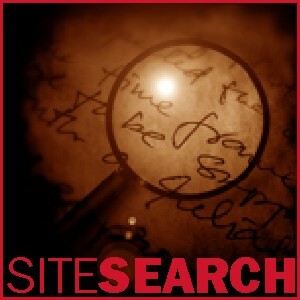 It was a simple two-story frame structure costing $800 to complete. This building was used until 1864, when all of the county records were moved uptown to a new brick building owned by H. C. Metcalf. Following this, the county conducted business in rent-free rooms. 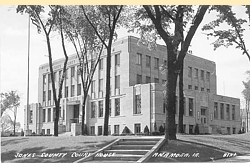 In 1935 the county finally approved the construction of a real courthouse. Total cost, some of which was paid via a federal grant, was $200,000. This building was dedicated on September 10, 1937, and nearly 60 years later it is still serving Jones County. 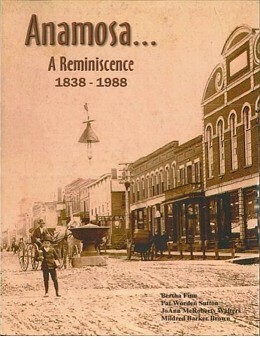 Anamosa - A Reminiscence - 1838-1988, was written by four local women— Bertha Finn, Pat Worden Sutton, JoAnn McRoberts Walters & Mildred Barker Brown—and is available online at Yumpu and at Iowa Heritage.